One would wonder how I've found the time to cook now that we have a baby. Given that he's still in the hospital, there are a few spare hours when I'm not doing errands, driving back and forth to the hospital, or trying to clean and organize the house - the nursery, the "office/guest room" and the rest of our humble abode. Cooking is my relaxation. Besides, we need to keep the healthier foods on hand. It's becoming way too easy to grab a meal or pizza out or on the go. I've not been able to get to the gym for two weeks, and eating well has been somewhat challenging. The first 5 days from the day Liz went into the hospital until she came home, I don't think I ate more than one proper meal during that whole time. Weight gain concerns aside, I am finding my biggest challenges to be making time for housework, cooking, and getting into a routine. Cooking at least allows me to feel like I have some small amount of control over my life right now. My present for attaining my driver's license and for the baby's entree into our world (aside from the Nibblet himself!) was the Xpress Redi Set Go cook unit. Granted, I can and do purchase a lot of cookware from Williams-Sonoma, but there is something so soothing and addictive for me when I watch cooking Infomercials. I have watched for hours, the infomercial for the Magic Bullet. 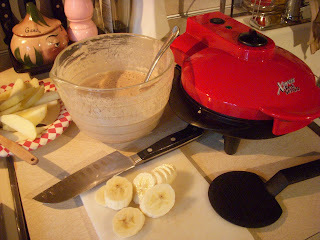 Even though I have a blender, a huge Cuisinart food processor, a mini-food processor, and a combo blender/food processor - I'm covered on my blending, whizzing, whirring and pureeing areas of the kitchen. However, I covet the Magic Bullet! The other infomercial that has hooked me is for the Xpress Redi Set Go! The thing about these infomercials is that they are so perfectly scripted, with a cast of hilarious characters and such easy to make food from your own ingredients, that you can't help but get convinced that you not only want these cooking machines, you entire culinary life depends on your having these items NOW! With the Magic Bullet, the dish that convinces me I need it is - Alfredo Sauce. I don't even eat that stuff any more. With the Redi Set Go, it's a combination of Instant Easy Pizza, Stuffed Chicken Breast made from scratch and the piece de resistance - cooking those Pillsbury Cinnamon Rolls - one or two at at time as opposed to turning on the oven and cooking the whole batch. Cinnamon buns whenever you want, without wasting oven heating time! Please baby please, I gotta have it! So, Liz ordered it for me and today it arrived. I wasted no time and made stuffed pancakes, which I will now share. Aside from my love of the cookbook, Deceptively Delicious, I do believe that I will be blogging recipes and meals made with my new favorite cook tool. So far, I made breakfast and dinner using the Redi Set Go unit. Tomorrow I may make all three meals in it! Whisk the dry ingredients, flours though Cinnamon, together in a large mixing bowl. In another bowl, beat the eggs, vanilla extract and the milk to incorporate. Pour the liquid mixture over the dry ingredients and stir to combine thoroughly, but do not over mix. There should be some small lumps. Set mixture aside and allow to sit for at least 10 to 20 minutes so the flours have time to absorb into the liquid. 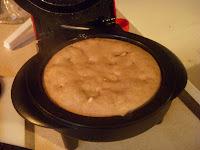 This allows the flavors to meld together and in general, makes a more tender pancake. Brush or spray oil or butter into the large well plate of the Xpress Redi Set Go cooker. Turn on the machine and allow it to heat up. When it's ready, melt some butter into the cooking plate sprinkle some sugar over the melted butter and arrange 5 or 6 apple slices over the sugar. Close unit and cook for 2 minutes to caramelize the apples. 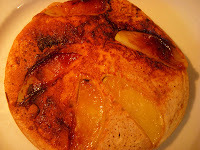 When the apples are cooked, pour the pancake batter over the caramelized apples. Close the unit and cook the pancake for 5 minutes or until the top portion is no longer wet. Carefully remove the pancake with the plastic spatula. Serve hot with butter, syrup, peanut butter, powdered sugar or whatever topping you desire! Repeat steps with bananas, except pour the pancake batter over the bananas before they caramelize. Next, top with chopped walnuts and chocolate chips (if using) and push the walnuts and chips into the wet batter to submerge them. Close the unit and cook for 5 minutes or until the top of the pancake is no longer wet. Xpress Redi-Set-Go is awesome. I have not seen any complaint so far. I got a great Xpress Redi-Set-Go deal yesterday.